Commitlog backups facilitate restoring backup data to a particular point in time. Commitlog backups are available for versions 4.6 or later of DataStax Enterprise. Enabling commitlog archiving modifies the Cassandra commitlog_archiving.properties configuration file. You must use Java 7 or later when backing up commitlogs. Click the Configure link for Commitlog Backup. The Configure Commitlog Backup dialog appears. Enter the path where you want to store the commitlogs on each node in Backup Directory. The location set under Backup Directory must be writable both by the user running DataStax Enterprise and the agent user. Starting in OpsCenter 5.1, the agent user and the DataStax Enterprise user are by default the same user. If the location runs out of disk space, the backup will fail. Configure the free disk space threshold to prevent backups from starting if there is not enough free space available. Commitlog files record every mutation of the data in a cluster, and can grow quite large over time. The disk performance of the commitlog backup location is extremely important because the disk write speed will likely be a bottleneck for write-heavy use cases, and read performance a bottleneck for restore operations. If you want to backup the commitlogs to a cloud storage provider such as Amazon S3, click Add Location. In the Add Location window, select the location type under Location and indicate how long the snapshot data should be saved by selecting a Retention Policy. To save the commitlogs to Amazon S3, select Amazon S3, set the bucket name, and your AWS key and secret. You can set a maximum upload rate to avoid saturating your network by selecting Throttle S3 transfer rate and setting the maximum MB per second to upload the data. To compress the data, select Enable compression. Compressing data reduces the amount of data going through your network, but increases the CPU load for the server. The Retention Policy can be set to Retain All, which saves the commitlogs indefinitely, or to a set period of time. Once the commitlogs are older than the time set in Retention Policy, the commitlogs will be deleted. 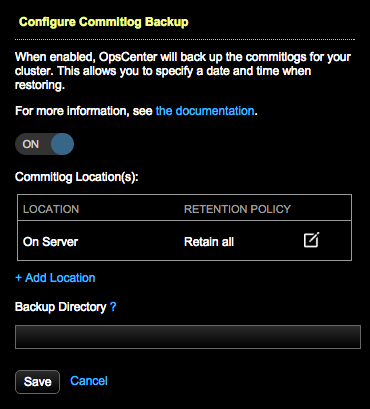 After enabling or disabling commitlog backups, OpsCenter prompts you to perform a rolling restart of your cluster.